Meet Greg Lehman and Dave Rigo. 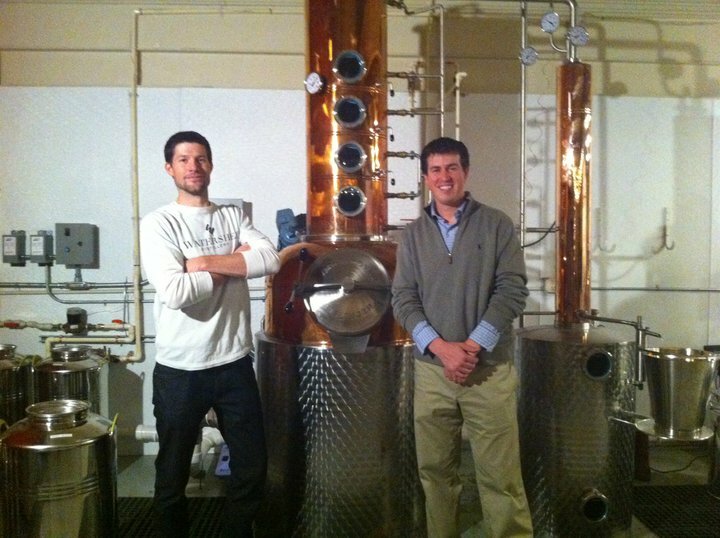 These handsome young cats are the minds behind Watershed Distillery, a micro distillery in Columbus, Ohio that has yet to celebrate its first birthday. 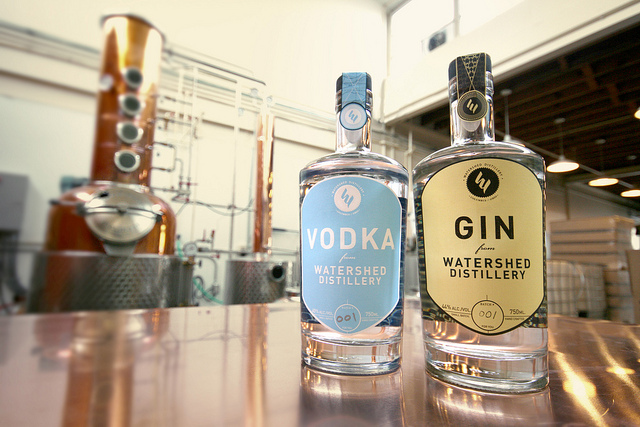 Watershed manufactures and bottles hand-crafted vodka and gin. Spirits? But this is a wine blog. Hang on to your britches, people. This is something special I guarantee you will enjoy. Both Dave and Greg recently left behind their solid paychecks in pursuit of the American dream. They've both got young kids (Dave's got another one on the way), wives who think they're more than a little crazy, and the kind of understated energy that quietly foreshadows their inevitable success. So, how's that pursuit going? Young businesses are notoriously fragile in the early days, but it's not too early to suggest that Dave and Greg at a minimum have a firm grasp on the American Dream's shirt tail: Sales are twice what they had planned for, the press has been flattering with mentions in Food & Wine, Maxim, and Beverage World, they have growing Facebook and Twitter followings, and a fan base ordering their product at bars. Their biggest problem is keeping up with demand. Not too shabby. Okay, so what does the American Dream taste like? For the vodka, it tastes like sweet spring water with a texture like a baby's pajamas. Clean, pure, and smooth. Dangerously smooth. For the gin, well, this is an experience worth seeking out. Summertime memories, past and future, live under this bottle's cork. The aromatics coming from this liquor will intrigue the most stalwart of wine drinkers. The fast rush of delicate botanicals is exhilarating and feminine, though not overtly perfumed. It's about halfway to a G&T before you've poured it from the bottle. There's no question it's gin, but it manages to be at once singular and restrained. Especially for someone who cares not at all for the cloying drape of heavy-handed juniper, this is an exceptional elixir. Balanced, refreshing, and incredibly drinkable. But most of all, these spirits taste like wearing jeans and flip flops to work. They taste like huge cojones and frightening leaps of faith and (pardon the sincere moment) hope. They taste like Johnny Paycheck singing Take This Job and Shove It. And they taste like independence, which is why this is what you should be drinking this weekend. For now, Watershed is only available at bars, restaurants, and liquor stores in Ohio, but you can expect that to change as word spreads of their quality and value. Once again, your writing makes for a great read - will pass this on to a buddy who is a gin aficionado (and enjoys clever writing). Thanks, Julie. Easy to get behind such a terrific story - and quality product. Tell your buddy he won't be disappointed. Cheers!